Protests do not occur frequently, but when they do occur the costs are significant—and when sustained, they can impact the process for many subsequent contracts. Government administrative processes often receive criticism for focusing on inputs and not outcomes. A specific example of this criticism has been registered by members of the acquisition community regarding source selection processes used for contracting that could be improved to reduce bid protests, the appellate process for contracting. Protests do not occur frequently, but when they do occur the costs are significant—and when sustained, they can impact the process for many subsequent contracts. 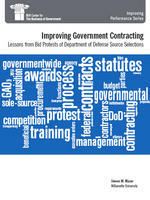 Bid protests and source selection processes continue to receive attention: a recent GAO study reported a government-wide increase in the number of protests by government contractors. Professor Maser’s research is based on interviews with members of the acquisition community, and on analyses of bid protests submitted to the Government Accountability Office (GAO) involving Department of Defense (DoD) agencies between 2001 and 2009. His work yields nine findings with recommendations for changes that can improve the source selection process. While the data collected for this report are from DoD, many recommendations apply to all government agencies. Professor Maser posits that agencies should increase the transparency of government contracting by disclosing more information about the contract process. This recommendation aligns with the Obama administration’s emphasis on increased transparency and openness. Other key steps that agencies can take to improve the process include simplifying solicitation requirements, investing in training the source selection workforce, and increasing agency monitoring. Implementing the report’s recommendations can bring three related and positive consequences. First, source selections will be more efficient and effective, generating greater value for taxpayer dollars. Second, relationships between government agencies and contractors will be less contentious and more productive. Third, costly bid protests will be reduced; the government will save money by not having to respond to as many protests. Responding to bid protests is costly, in terms of both dollars spent and staff time devoted to preparing the government’s response to the bid protest. In addition, bid protests delay the award of contracts, which poses a problem when an agency wants to award a timely contract to fill an important objective. As a result of an improved source selection process, the contracting community will be able to devote more resources to providing products or services as opposed to anticipating or engaging in bid protests. Contractors would likely welcome a less contentious system that they perceive to be more fair and transparent. As federal agencies across government attempt to improve their administrative processes, including the bid process, this report provides useful insights and recommendations on how to reduce the number of source selection protests. And in an era of tight budgets, reducing costs associated with bid protests in government will save key resources for mission-critical activities. Listen to Professor Maser's interview on Federal News Radio.